Superadobe is a form of earthbag construction, using layered long fabric tubes or bags filled with adobe (earth from the site) and typically shaped into beehive structures to form "Domed" homes. Superadobe has been growing in popularity because it is a natural, sustainable and affordable home design. Preview for Upcoming Feature Show on the DIY network. Expected realease date in 2018. Many different materials can be used to construct Superadobe. Ideally you would have earth or sand, cement or lime, and Superadobe polypropylene tubing (available from Cal-Earth or other suppliers); bags can be polypropylene, or burlap. What is important is that they are UV resistant or else quickly covered in plaster. Virtually any fill material will actually work including un-stabilized sand, earth, gravel, crushed volcanic rock, rice hulls, etc. If the fill material is weak the bags have to be really strong and UV resistant, or else plastered right away. The material can be either wet or dry, but the structure is more stable when the tube's contents have been moistened. Other materials needed include water, shovels, tampers, scissors, large plugs or pipes (for windows), and small buckets or coffee cans for filling the sacks. If you decide to go the quicker way, then electric or pneumatic tampers can make the tamping easier, electric or gas powered bucket chain that can reach 23 ft or higher would eliminate the need of manual filling of sacks or tubing using coffee cans or small pails. The foundation for the structure is formed by digging a 18” deep trench. Two or three layers of the filled polypropylene sand tubes (superadobe tubing) are set below the ground level in the foundation trench on the poured concrete foundation footings.. A chain is anchored to the ground in the center of the circle and used like a compass to trace the shape of the base. Another chain is fastened just outside the dome wall: this is the fixed or height compass and gives you the interior measurement for every single layer of superadobe bags as they corbel ever higher. The height compass is exactly the diameter of the dome. The center chain/compass is used to ensure the accuracy of each new superadobe layer as it is laid and tamped. On top of each layer of tamped, filled tubes, a tensile loop of barbed wire is placed to help stabilize the location of each consecutive layer: it plays a crucial role in the tensile strength of the dome - it is the 'mortar'. 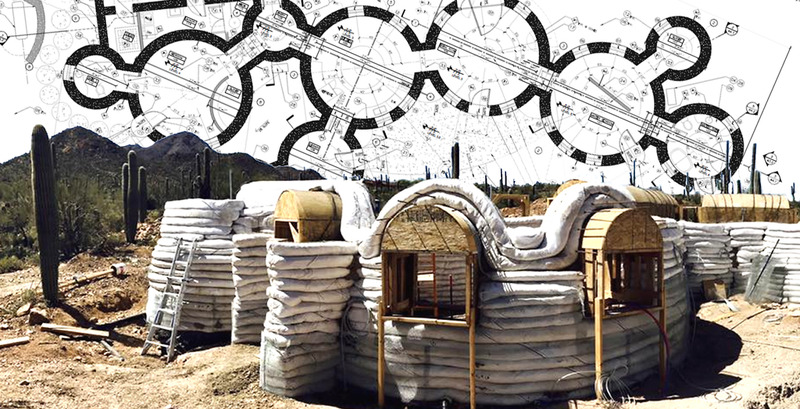 It is not recommended to exceed the 19’ interior diameter design in size, but many larger structures have been created by grouping several "beehives" together to form a sort of connected village of domes. Naturally this lends itself to residential applications, some rooms being for sleeping and some for living. Once the corbelled dome is complete, it can be covered in several different kinds of exterior treatments, usually plaster. Khalili developed a system that used 85% earth and 15% cement plaster and which is then covered by “reptile”, a veneer of grapefruit sized balls of cement and earth. Reptile is easy to install and because the balls create easy paths for stress, it doesn't crack with time. There are many different possibilities. Some Superadobe buildings have even been covered by living grass, a kind of green roof but covering the entire structure. Any exterior treatment and building details would need to be adapted to a region’s specific climatic needs. Offering affordable hourly rates for Drafting or Architectural Design and Consultation. Residential upgrades, remodels or site specific new construction. Zoning Review + Programming, Use Analysis, Spatial/need Planning, Design Presentations, Exhibit Boards, As Built Documents, Schematic Design, Design Development, Rendering, 3D Modeling, Construction Documents, Engineering Coordination, Permit Documents, Finishes, Interior Drawings, Landscape Drawings and Design Consultations.